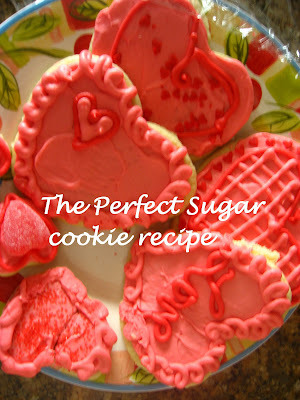 A Day In The Life...: Sugar Cookies and Valentines Day!!! *here's what I've learned about making these cookies turn out perfect. don't underbake/overbake them. It's tricky... but 360 (wierd temp) 10 min. usually does it for my oven! cutting the butter into the flower is the trick I think to making the texture perfectly flakey and delicious. cutting the cookie dough thicker (like 1/4 inch), then when baked makes them rise to the perfect thickness.